It’s been over 40 years since Jaws arrived on these shores, and a whole new era of moviegoing followed in its wake. (Because it concerns a shark, that turn of phrase is even more appropriate that usual. Why yes, I am feeling very pleased with myself, thanks.) That it ushered in the modern blockbuster age would be reason enough for Jaws to loom large in film history—it is a very large shark, hence the need for a bigger boat, nailed it—but what really makes it so indelible is that Jaws is, to use a technical term, an excellent goddamned movie. Some of that is due to Steven Spielberg’s keen understanding of suspense and fear, some of that is because it’s a darn good yarn, and some that it’s got one of the most iconic scores in film history. But in this writer’s opinion, the real meat of Jaws—a shark that eats meat, human meat, I’m on fire—is the very fine character work. That’s a long way of saying the acting in this movie is what makes it really special (well, that, and the giant damn shark). One of them will be talking about his work in that movie later this month. 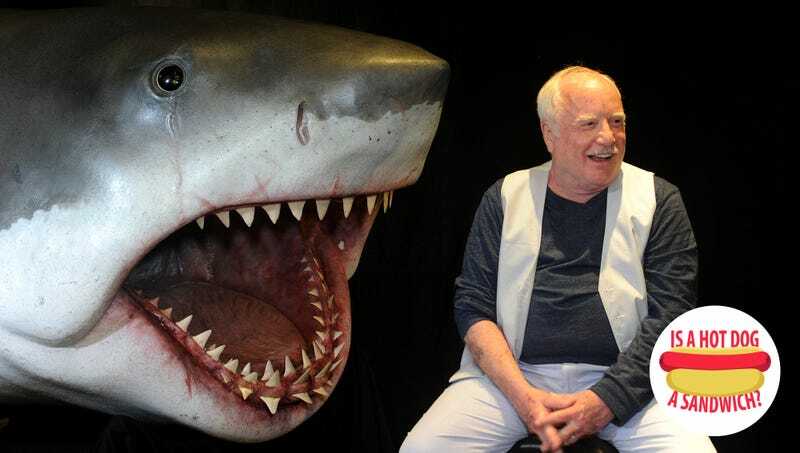 Richard Dreyfuss will be at the Tivoli Theater in Downers Grove, Illinois on January 31 to talk about the little shark movie he did that one time. We went ahead and saved you some time in the Q&A. You can ask him about the terrible mayor or the cage-diving scene; you can ask about Robert Shaw or Bruce the special-effect shark or how he maintained that beard. However, there is no longer any need to ask him whether or not a hot dog is a sandwich. Richard Dreyfuss: Ah, so you’re the people who put tomatoes on your hot dogs. TO: Wow, yes, we do, and that’s what I wanted to ask you about. Is a hot dog a sandwich? RD: Because it fulfills the definition of sandwich, which is a piece of meat between bread. RD: Invented by the Earl of Sandwich! A gambler, who didn’t want to have to leave the table for food. TO: Indeed. So, by that standard, do you consider a taco a sandwich? RD: I mean, if I was going to appear on College Bowl, I guess I could say yes, but no, to me, that is otherwise established. Hey Angela Kinsey, is a hot dog a sandwich? Hey Mara Wilson, is a hot dog a sandwich?